Abstract: Retention and Resistance combines personal student narratives with a critical analysis of the current approach to retention in colleges and universities, and explores how retention can inform a revision of goals for first-year writing teachers. Retention is a vital issue for institutions, but as these students’ stories show, leaving college is often the result of complex and idiosyncratic individual situations that make institutional efforts difficult and ultimately ineffective. An adjustment of institutional and pedagogical objectives is needed to refocus on educating as many students as possible, including those who might leave before graduation. Much of the pedagogy, curricula, and methodologies of composition studies assume students are preparing for further academic study. 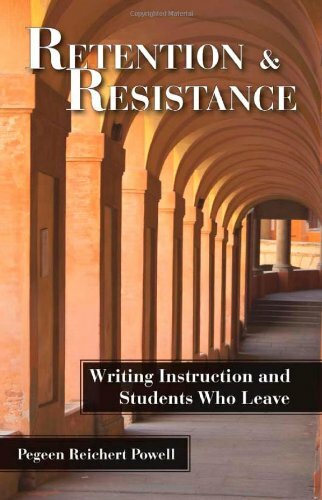 Retention and Resistance argues for a new kairotic pedagogy that moves toward an emphasis on the present classroom experience and takes students’ varied experiences into account. Infusing the discourse of retention with three individual student voices, Powell explores the obligation of faculty to participate in designing an institution that educates all students, no matter where they are in their educational journey or how far that journey will go.